Heavy duty P.V.C. 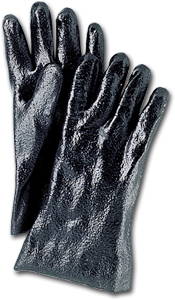 coated glove. 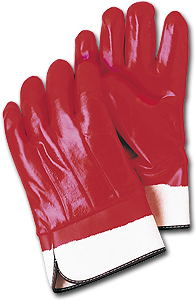 Best all around glove for handling a wide range of acids, caustics and solvents. Offers a high degree of abrasion resistance. Two piece napped jersey liner eliminates seams from the work area and insulates against moderate heat and cold. Knit wrist. Same as YP-100. Elbow length 18". Very flexible, industrial weight, P.V.C. 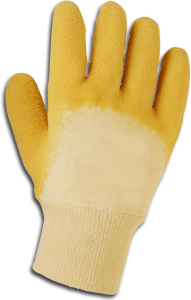 coated glove, with knit wrist. Unique non-skid finish makes it ideal for superior wet & dry grip. P.V.C. 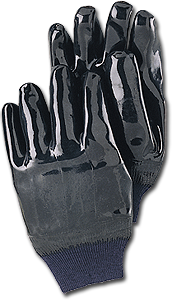 coated, foam lined glove. Designed for winter cold storage use. Liquid proof vinyl coating resists a wide range of chemicals and solvents. Foam insulation keeps hands warm. Also available with bright fluorescent orange colors for safety and traffic control. 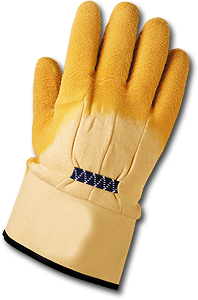 Multi-purpose chemical, abrasion and temperature resistant hand protection with durability and flexibility. Length 12". 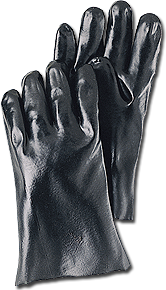 PVC coated rough finish, 12"
Tough nitrile compound will out-perform latex and neoprene in aromatic petroleum, and chlorinated solvents. 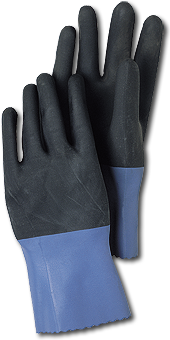 Snag and puncture resistant, yet is pliable and easy to work with. Available in S, M, L, XL, is 13” long .018 gauge. Flock lined. 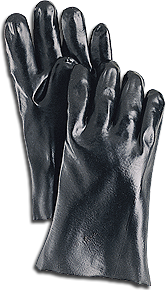 Tough nitrile compound will out perform latex and neoprene in aromatic petroleum and chlorinated solvents. Snag and puncture resistant. 18" length .022 gauge. 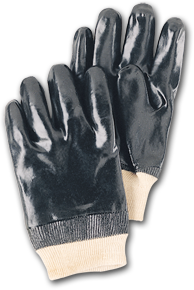 Premium rubber coated cut-resistant glove with comfortable soft knit jersey lining. 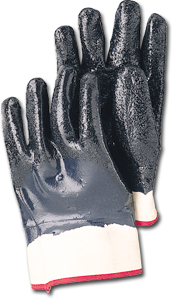 Glove has a crinkle finish which provides safer handling because sharp edges roll and bounce over glove surface. Knitwrist. 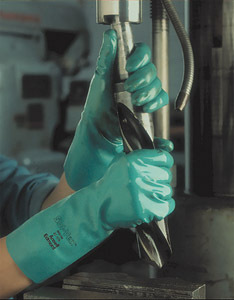 Same as 16-340 with safety cuff. 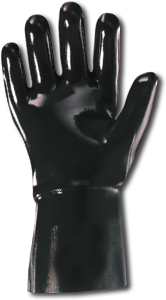 Neoprene coated glove. Outperforms P.V.C. in most acid, solvents and oils. Has a working temperature range of 0° -300°. Heavy duty canvas liner improves snags and puncture resistance. 10" length. 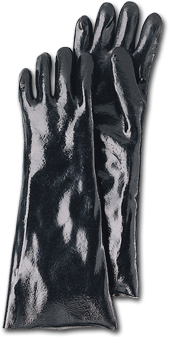 Nitrile-coated glove. Provides cut, puncture, snag and abrasion resistance. Excellent resistance to oil and grease.